Picture: Sarah Pinault. My very own Gruffalo family. Since having children I have enjoyed sharing my own favorite childhood stories with my boys, I have also enjoyed discovering new stories with them. One of my favorites was discovered shortly after having my first son in 2009, with the help of Grandma. 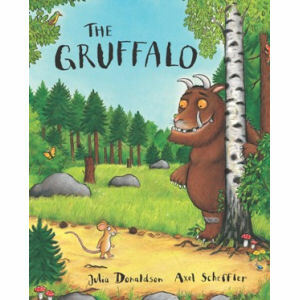 The Gruffalo was then celebrating its tenth year of publication and if you know our family, then this is the first book your child will receive as a present from us. If they like it as much as we do, it will be followed with The Gruffalo’s Child. It is one of those stories that sticks with you and just keeps getting better with each telling. Now that my second son is expressing interest in picking his own bedtime stories, we read through both of these tales daily. He knows all the words, and acts them out as he is sitting in my lap. Written by Julia Donaldson, the story is simple, the rhymes are clever, and the repetition makes it feel instantly familiar without ever becoming tiring. The mixture of fantasy and reality are the perfect blend for the childhood imagination. Along the lines of Roger Hargreaves and Roald Dahl, The Gruffalo sneaks in that spark of the unusual to a young audience. Also, just as the work of Roald Dahl is incomplete without the illustrations of Quentin Blake, the story of the Gruffalo is enhanced by the magnificent illustrations of Axel Scheffler. The pair have collaborated on well over a dozen stories together; in the Pinault home alone you will find Tabby McTat, the Musical Cat , Charlie Cook’s Favorite Book , and The Smartest Giant in Town , all of which are regulars in the night time rotation. This story has been a hit with every child we have introduced it to. In fact it is a hit worldwide and has spawned a sequel , two movies , many games, and an extensive line of merchandise . Perfect for a Geeklet to obsess over. The website goes from strength to strength, with games and sing-a-longs. The movies are just as entrancing as the standalone story. Each about twenty minutes long, they are narrated by a mother squirrel voiced by Helena Bonham Carter. They feature the voices of Robbie Coltrane ( Harry Potter’s Hagrid), James Corden ( Doctor Who’s Craig Owens), and John Hurt ( Harry Potter’s Ollivander, and the War Doctor). However it is the music by French composer René Aubry that really sets the movies apart from other animations. It is an absolute delight to listen to, wonderfully entertaining and calming at the same time. Thanks in large part to a beautiful score, it is one of those movies that you don’t mind your child getting addicted to, that you can watch or listen to many times over and not get exceedingly frustrated with! If you enjoy listening to stories on long rides with your children, there is a fantastic box set of Julia Donaldson stories which includes The Gruffalo. Many of the stories are read, and then sung by Imelda Staunton, whose voice you will recognize and fear as the voice behind Dolores Umbridge in the Harry Potter franchise. Be warned however, if your children are anything like mine, this 14-minute tale will be on repeat for every hour long drive you take. You will also recognize the voice of Jim Carter on one of the stories. Jim Carter, of course, plays Mr. Carson on Downton Abbey. If you want to hear him sing, this is the set for you. *Musings on The Gruffalo were originally posted at Wired.com/GeekMom.